One of the biggest riddles in physics is the apparent imbalance between matter and antimatter in our universe. To date, there is no explanation as to why matter and antimatter failed to completely annihilate one another immediately after the big bang and how the surplus matter was created that went on to form the universe as we know it. Experiments conducted at Johannes Gutenberg University Mainz (JGU) have contributed towards a resolution of this problem. For the first time a direct and high-precision measurement of the magnetic moment of the proton has been conducted successfully. The magnetic moment is one of the fundamental properties of protons, which combine with neutrons to form the nucleus of atoms. In principal, the method can also be used to measure the magnetic moment of an antiproton with a similarly high precision, making it possible to investigate matter/antimatter asymmetry. Related experiments are now being set up at the CERN research center in Geneva, Switzerland. Years of preparation were necessary before the measurements were possible and the results obtained have far exceeded those of all previous attempts. In addition to Mainz University, the GSI Helmholtz Center for Heavy Ion Research in Darmstadt, the Max Planck Institute of Nuclear Physics in Heidelberg, and the Japanese RIKEN research facility all took part in the experiment. Using a double Penning trap, the researchers were able to determine the relevant parameter, the so-called 'g-factor,' with a precision of 3.3 x 109. The result is 760 times more precise than all the results documented independently at Mainz University and Harvard University in 2012 and three-times more precise than the result obtained by an indirect measurement in 1972. "Protons are like tiny rod magnets. They have a magnetic moment 24 magnitudes – equal to one millionth of a billionth of a billionth – weaker than a typical compass needle. This is the first time we have been able to measure anything on this scale," said Andreas Mooser, primary author of the study and a member of Professor Jochen Walz's research team at Mainz University. The key to success proved to be the use of a double Penning trap, i.e., an electromagnetic particle trap, to isolate and evaluate a single free proton. An analysis trap serves to detect spin-quantum jumps of the proton, while in a precision trap precise frequency measurements are conducted. 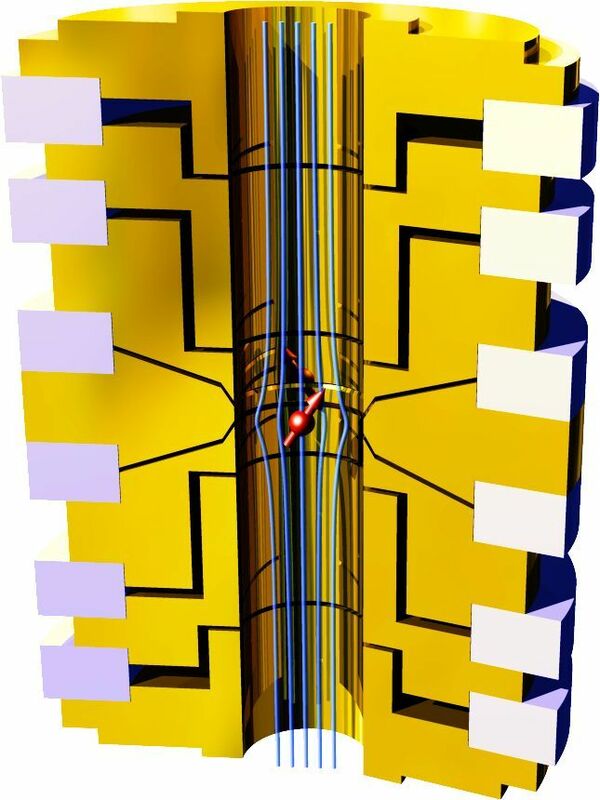 It has proved possible in the past to use Penning traps to directly measure the magnetic moment of individual particles such as electrons and their antiparticle counterparts, positrons. But adapting this approach for use with protons is an enormous challenge as the magnetic moment of a proton is 660 times smaller than that of an electron. The apparatus for the experiment needed to be far more sensitive. The collaborating partners were able to develop such a highly sensitive double Penning trap so that they could undertake the long-planned measurements. Apart from the direct measurement performed in Mainz, the previous most precise measurements were obtained by means of an indirect method in 1972, where the hyper-fine structure of atomic hydrogen was measured and subsequently theoretical corrections were applied. The principle of a direct measurement in a double Penning trap can also be used for the antiproton. "We can then compare the two results and test these against the fundamental predictions of the standard model," explained Stefan Ulmer, coordinator of the BASE joint project, which is currently setting up a corresponding experiment at CERN in Geneva. 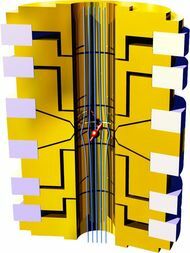 Using the double Penning trap technique for the antiproton could enhance the precision of results obtained during the ATRAP project in 2013 by a factor of at least 1,000. Assuming that the measured values differ, this would represent an important step forward with regard to understanding the matter/antimatter asymmetry of our universe. Double Penning trap used to measure the magnetic moment of the proton. The double Penning trap is made of gold-plated cylindrical trap electrodes; the individual trap electrodes are isolated from one another using sapphire rings. During measurements the trap is in an ultra-high vacuum. To the right of the image is the outer housing of a detection instrument which allows for the observation of single protons. The entire structure is about 20 centimeters long. The oscillating proton (red) generates a tiny current which is recorded using highly sensitive electronic detectors. The red arrow represents the magnetic moment of the proton; the green lines indicate the magnetic field in the trap.